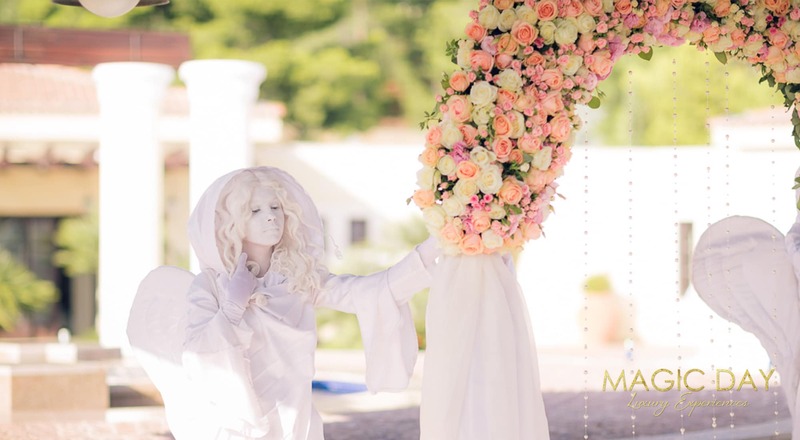 Luxury wedding in Italy took place on a day full of surprises. 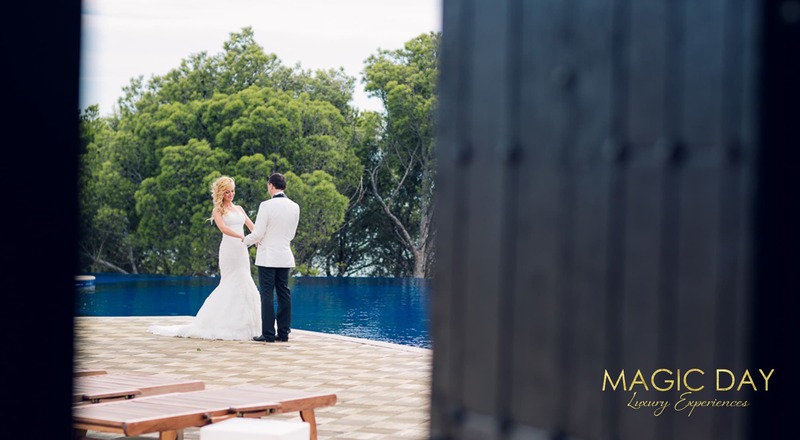 Our team had to fight a gale, redecorate and relocate the ceremony after an unbelievable downpour that came out of nowhere and even move the guests to the wine cellar after the wind grew so strong that it started moving the marquee with the dining zone. But none of these accidents could influence the positive emotions everybody was having. After all, Italians do say that a rain on the wedding day means that the bride will be very fortunate – sposa bagnata, sposa fortunata. The symbolic ceremony took place in front of the flower arch held by two angels and when the groom was finally allowed to kiss his bride, thirty fireworks emphasized the moment behind the couple. 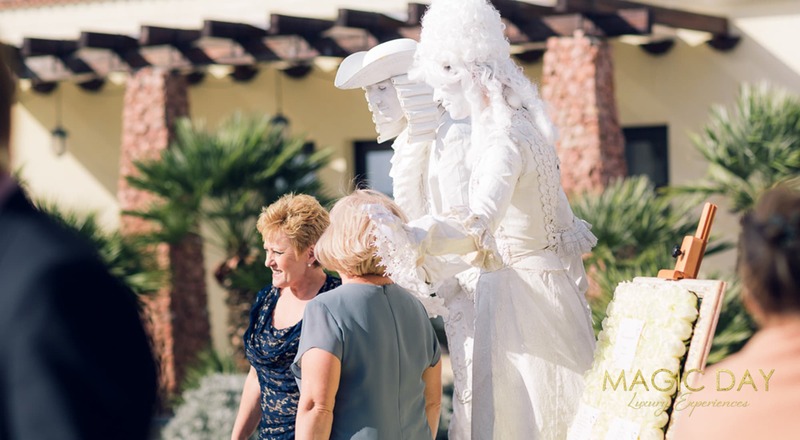 Two more living statues welcomed the guests to the dinner zone of this luxury wedding in Italy. 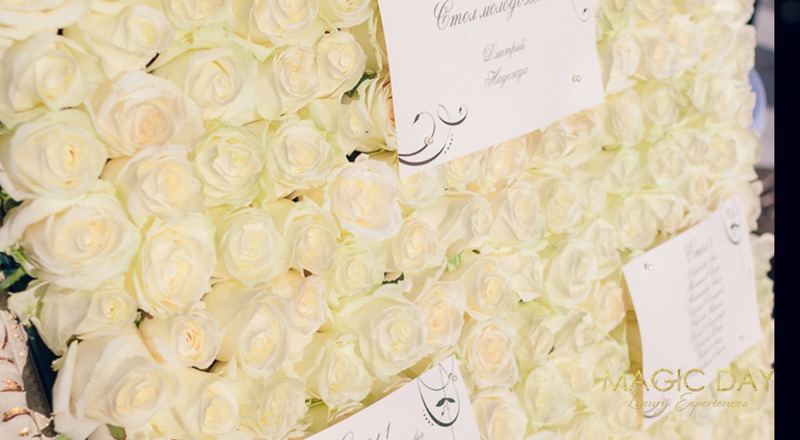 Our flower designer filled a picture frame with over four hundred rose buds for it to serve as background of the sitting plan. 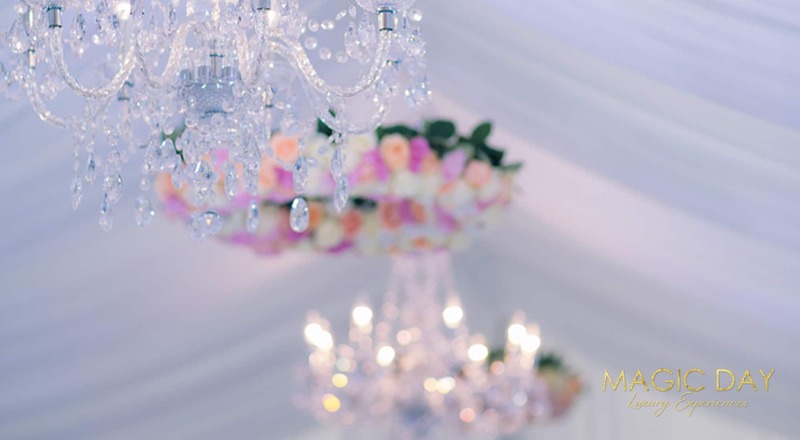 Luxury flower and crystal chandeliers embellished the ceiling of the dinner marquee. The guests were entertained by close-up magic show that made many of them wonder if the magician was in fact a real one. 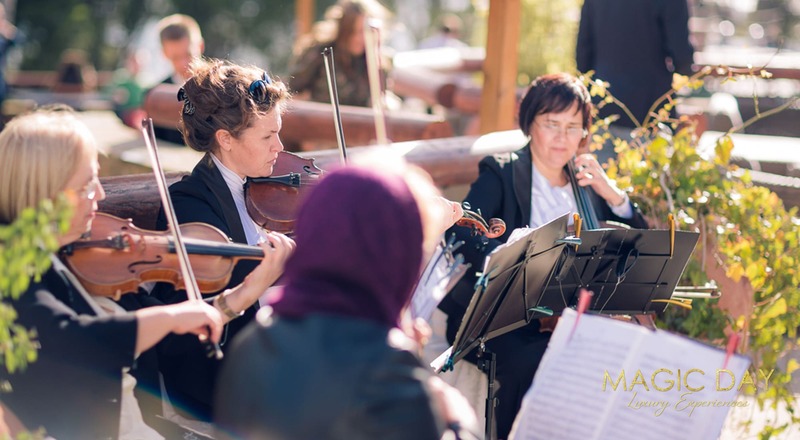 String quartet and a superb performance by electronic violin player created an atmosphere full of fun at the beginning of the dinner. The favourite TV personality of the couple was animating the evening with fun interview-styled speeches from the guests. 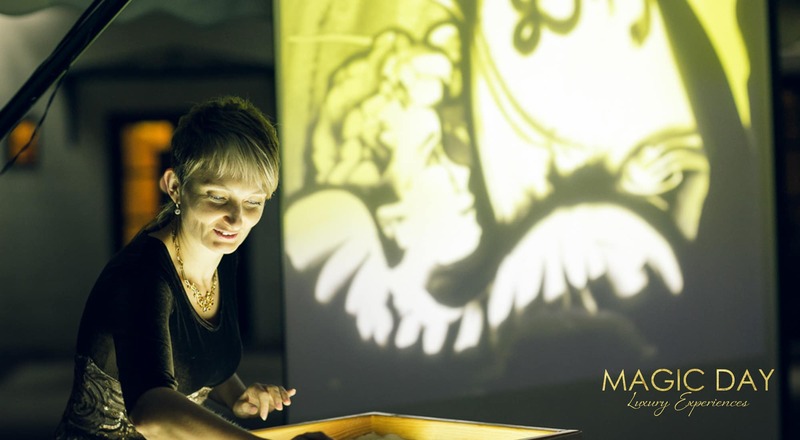 The sands of time idiom got a new meaning at this luxury wedding in Itlay after our sand artist displayed a story created especially for our clients. Over the span of ten minutes the artist created several sand pictures describing the whole journey our clients took from the day they met until their wedding. 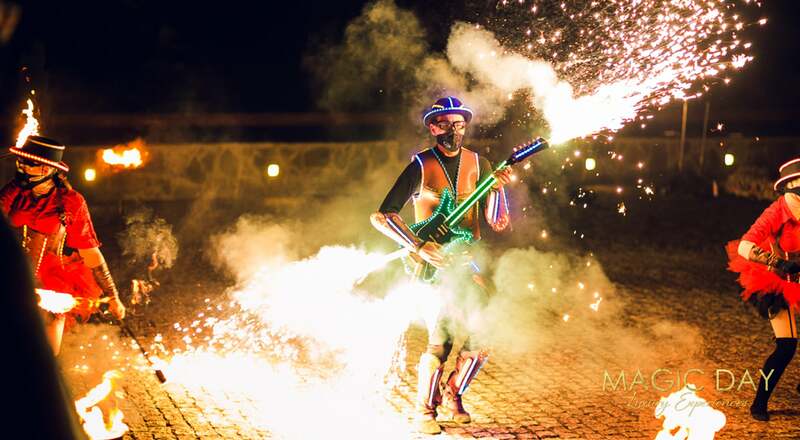 As soon as the dinner came to an end, our coordinators invited everybody to witness an incredible fire show designed especially for this occasion. 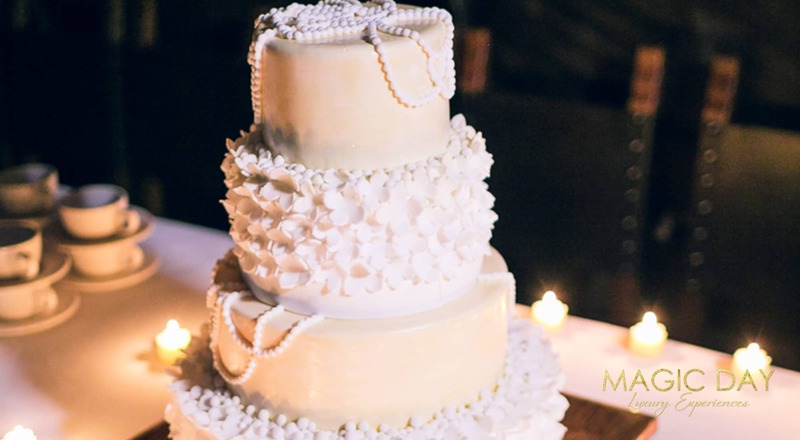 Due to the weather conditions, we had to invite our clients and their guests to the wine cellar at the time of cake cutting. 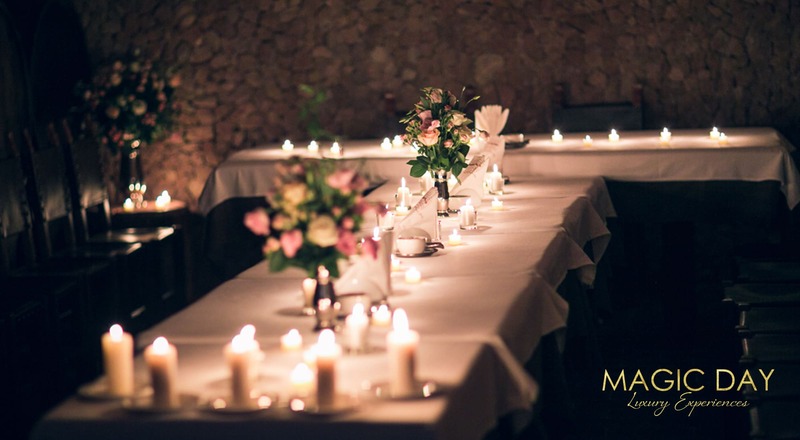 Being a very atmospheric venue, the cellar turned out to be the perfect end of the day. A perfect day requires a perfect finishing touch. 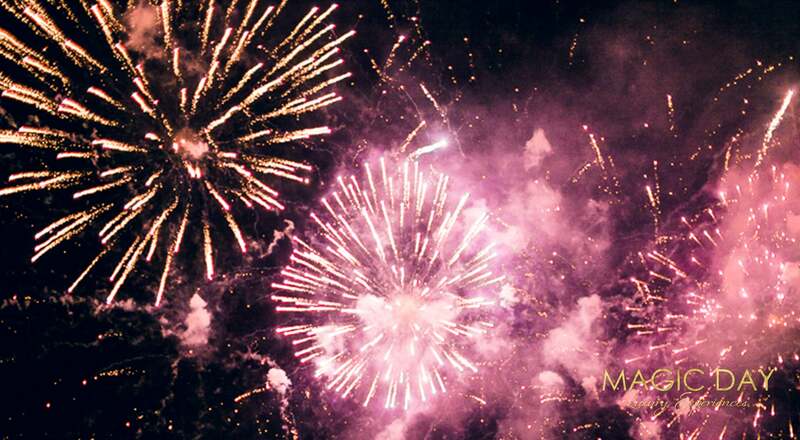 Grand fireworks display played its role impeccably, leaving everybody in a very uplifted mood after this luxury wedding in Italy.